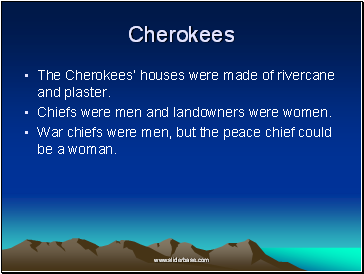 The Cherokees’ houses were made of rivercane and plaster. Chiefs were men and landowners were women. War chiefs were men, but the peace chief could be a woman. 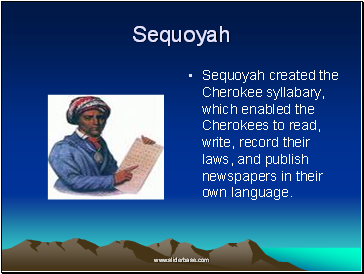 Sequoyah created the Cherokee syllabary, which enabled the Cherokees to read, write, record their laws, and publish newspapers in their own language. During the 1800’s the US government created an Indian Territory in Oklahoma. 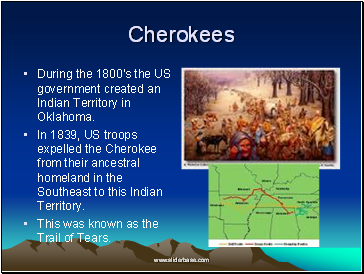 In 1839, US troops expelled the Cherokee from their ancestral homeland in the Southeast to this Indian Territory. This was known as the Trail of Tears. 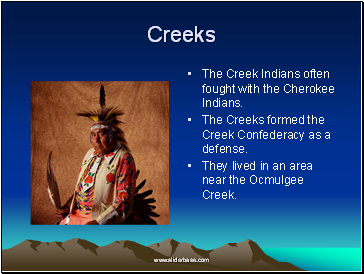 The Creek Indians often fought with the Cherokee Indians. 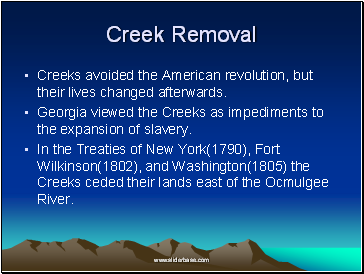 The Creeks formed the Creek Confederacy as a defense. They lived in an area near the Ocmulgee Creek. 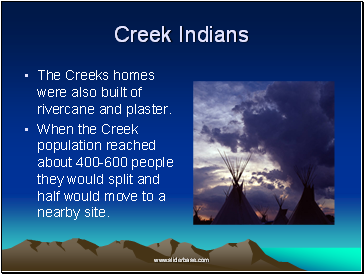 The Creeks homes were also built of rivercane and plaster. When the Creek population reached about 400-600 people they would split and half would move to a nearby site. Creeks avoided the American revolution, but their lives changed afterwards. Georgia viewed the Creeks as impediments to the expansion of slavery. In the Treaties of New York(1790), Fort Wilkinson(1802), and Washington(1805) the Creeks ceded their lands east of the Ocmulgee River. 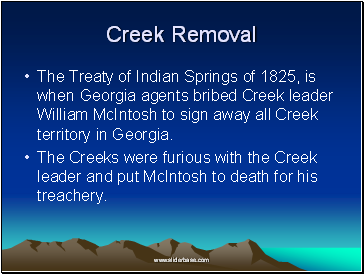 The Treaty of Indian Springs of 1825, is when Georgia agents bribed Creek leader William McIntosh to sign away all Creek territory in Georgia. The Creeks were furious with the Creek leader and put McIntosh to death for his treachery. 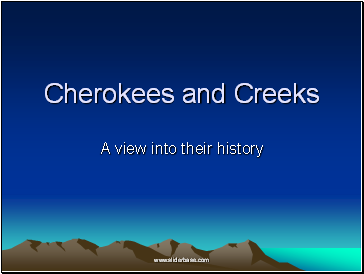 Using the websites listed we will now research more about the Cherokee and Creek Indians on the internet. Then we will create a graphic organizer on Inspiration listing the details that we learned about them. Finally we will create a Venn diagram using Inspiration that compares and contrast these Native American cultures.